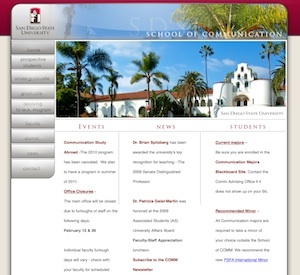 The School of Communication at San Diego State University offers two majors: Communication and Health Communication. The School of Communication has a long and rich tradition in both undergraduate and graduate studies. Faculty members are nationally recognized for their scholarship and teaching. Collectively, the members of the Communication faculty have published hundreds of journal articles, books, and book chapters. They are regular contributors to scholarly conferences, regionally, nationally, and internationally. Members of the faculty are recognized experts in areas such as nonverbal communication, stalking and other aspects of the “dark side” of communication, rhetorical theory, organizational communication, leadership, emotion and immediacy, gender communication, and many others.